I know it's the start of a new month and I should be choosing a new #flavourofthemonth but I can't. I've only had the chance to write up 2 rieslings in March and I just don't think that's enough - do you? So I've decided to extend the #flavourofthemonth for April too. This week, in case you missed the giant photo above I'm talking about Langmeil's Riesling. 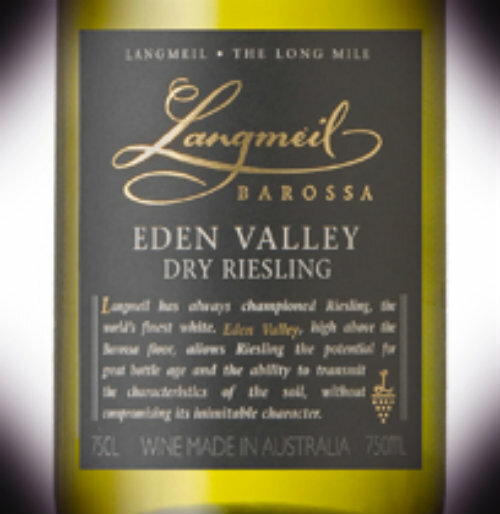 Langmeil is another fabulous Barossa winery. The cellar door is in Tanunda - my favourite town in the Barossa because of the proximity of my favourite wineries. I'd love to tell you all about the first time I visited the cellar door, but I suspect it was my third or fourth stop on the day so the details are a little hazy ;-) Anyway on to the wine. While the cellar door is in Tanunda the grapes from the riesling come from Eden Valley which is cooler than the Barossa Valley's lower regions. When you first pour the wine into the glass you'll notice that it's very pale yellow with almost a little green to it - like fresh straw that hasn't quite dried out yet, so it doesn't have the intense yellow colour. The smell is fresh with lots of citrus & lime, and hints at what the tast will be like. Like most of my favourite rieslings this one is crisp and acidic. There's lots of lime, and it's got a great finish to enjoy when you get home after a long hot day at work in summer. If you haven't guessed it by now I love spicy food - especially asian flavours. This wine is a great compliment to a good Thai dish, a spicy baked fish, or anything with a bit of a kick. The acidity balances the spice well and makes for an enjoyable meal. At around $25 a bottle it's a good buy too. Here's to enjoying more rieslings this month.